Increase your business efficiency and productivity through innovative technology. SharePoint can help your organisation thrive and prosper in today’s competitive environment. Microsoft SharePoint is a document management and collaboration tool used by organisations to help manage and control their internal content. It can be deployed on a local server, or hosted in the cloud under the SharePoint Online offering. According to Microsoft, SharePoint is now used by more than three quarters of Fortune 500 companies. SharePoint integrates tightly with Office 365, and functions as a corporate intranet and document management system, allowing you to store and share documents more effectively than a traditional file system. It ensures that everyone in your organisation has the information they need at their fingertips. When hosted in the cloud, SharePoint Online becomes your gateway to the your office, offering a consistent experience across multiple devices, and supporting mobility, remote access and web apps, as well as enterprise-grade security, scalability and compliance. Today more than ever, Australian businesses must increase their efficiency and productivity through the strategic implementation of innovative technology. 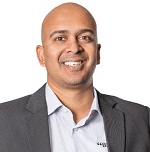 Here are six key ways in which Microsoft SharePoint can help your organisation to thrive and prosper in today’s competitive environment. SharePoint is closely integrated with the common Microsoft applications that your employees use every day, such as Word, Excel, amongst others. This simplifies the way in which users interact with information and streamlines processes like document review and approval, signature collection, issue tracking and reporting. Also, as SharePoint is part of Office 365, your business needs an account to use it. This means that with your Office 365 account, any Microsoft applications and software you already have or add to your package, such as Microsoft Office, will deliver a consistent experience across the company as all your staff will work on a single, and latest, version of Microsoft products. As organisations continue to adopt mobility, remote access and bring-your-own-device initiatives, employees increasingly require instant access to critical business applications, from any location, at any time. With SharePoint Mobile and SharePoint Online, you can use your device to access company data from anywhere in the world and collaborate with colleagues even when you’re not in the office, this means you can open, review and edit documents any time on any device that is convenient for you. SharePoint’s smart electronic forms let you collect data from partners, suppliers and customers through a simple browser interface so you use the information more efficiently, such as adding it to workflows. The integrated validation rules ensure that the collected data is consistent and accurate, and the direct interface with back-end systems eliminates the risk of manual data-entry errors. Examples of forms in SharePoint are expense reports or event registrations. The forms are customisable and can range from being simple, as collecting basic information/data the business needs, to complex by taking an essential part in large business processes. SharePoint’s interactive business intelligence portals gather mission-critical data from disparate sources, and display this information in a convenient and user-friendly format, such as graphs and dashboards, that employees can use to help make better informed business decisions. Users can easily build personalised views, as well as creating and submitting their own content for approval. 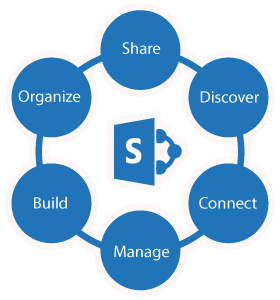 SharePoint enables staff to connect effectively with each other via a central portal. This is especially beneficial for organisations with remote geographical sites. In the past, isolated branches may have been cut off from the rest of the business, but SharePoint brings everyone together to interact at all times, fostering a culture of collaboration and creativity. Either used as an intranet portal or document management solution, SharePoint is a hub that makes company’s goals and metrics visible to all employees, offering also a common space to instigate discussions through forums and discussion boards. By establishing security, storage and audit policies in line with compliance regulations, you can ensure that sensitive corporate data is controlled effectively, thereby reducing the risk of litigation to your business. SharePoint also delivers peace of mind through the ability to protect files from unauthorised use. Employee permissions can be controlled at the folder or document level, and cloud-hosted data is encrypted to prevent unapproved access. Microsoft SharePoint is a powerful platform that delivers countless benefits to your business. There are also many other features not covered in this article, which include the ability to create extranets, public-facing websites, corporate social networking apps & wikis, detailed reporting & charts, and much more. If you’d like to learn more about how your business can benefit from Microsoft SharePoint, then contact Bremmar today on 1300 991 351 or email help@bremmar.com.au.